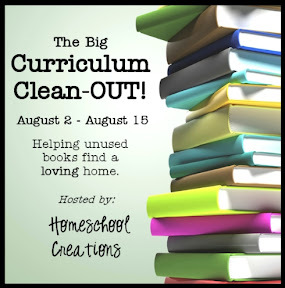 From August 2nd - August 15th I'm hosting a curriculum 'giveaway' of sorts here. Everyone loves to win things and giveaways are fun ~ so lets do it all together! Why? My shelves are overflowing! I have unused books and curriculum that are just lonely sitting on my shelves. They need a home that will appreciate them - and yours might just be the place for them. I'm talking about those great books that have so much life in them they are almost brand spankin' new. You can join in! If you have some books or materials that you would like to give away, you can be a part of this! You can give away something on your blog and/or you can visit others giveaways and enter to win some great stuff! Sound like fun? Start scouring your shelves, closets, and check under the couch for books and products you can use as giveaways. Check back soon, because I'll be posting the specifics in the next few days to answer all those questions swirling around in your head right now! sounds fun- although i only have a 20 month old (i might not have a ton of little bitty curriculum, but i may have some second grade materials laying around! i will definitely check it out! This sounds like such fun and a super idea too! Looking forward to it! Thanks for taking the time to do this!! This comes at a great time! I have been cleaning out my bins and I have lots of curriculum hanging around that I would like to bless another family with! I have been cleaning and and organizing and need to get rid of a few things - I was going to go for some points and mooch them, but I think I can find a few things to give away!